How We Roll, Dec. 11: will we ever have a true car-free city? Things to read whilst transiting: the ultimate guide to winning your white elephant gift exchange on the Five Thirty Eight blog. I ended up with a Rudolph mug after someone ‘stole’ a really cool marshmallow gun in a white elephant last week. Very nice landing page with many short and digestion-friendly articles on the ongoing summit in Paris. 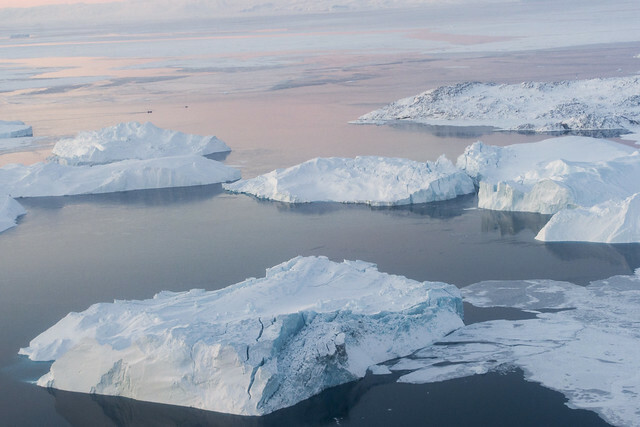 Two tidbits worthy of mention: scientists don’t believe the emerging deal will limit the average global rise in temperatures enough to prevent “catastrophic” damage from global warming. And the theory that all those melting glaciers/icebergs will trigger a new ice age? Don’t bet it, says the Old Grey Lady. 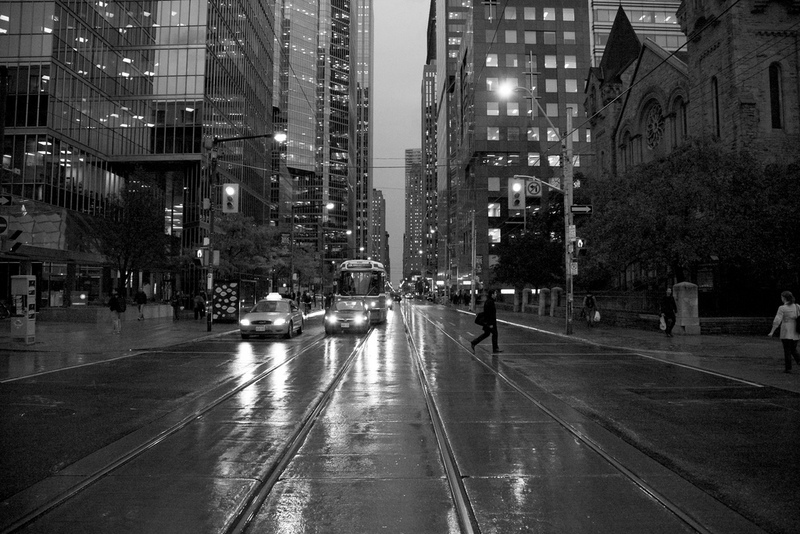 Toronto in lovely black and white. Photo by Steve Harris, via Flickr creative commons. A number of European cities are working on proposals that would take roads from cars and give them to pedestrians and cyclists. Hamburg is one of them: “Hamburg, on the other hand, is currently making waves by enforcing an auto-ban on a number of urban roads to develop a network of route for pedestrians and bikes that link parks and open spaces together. In North America, there’s talk of Toronto maybe getting a car-free street during rush hour. But that’s about it, although a number of cities are expanding transit and bike lanes. Coverage of yesterday’s incident along Colorado Avenue — a truck turned left in front of a test train. The train runs down the middle of Colorado Avenue between 4th and 17th Street in Santa Monica, a street-running stretch in which there are no crossing gates and train operators follow traffic and train signals. There is testing scheduled from 8 a.m. to 8 p.m. Monday through Friday next week. Perhaps most troublesome is that there are more lower income households and middle income households have seen their accumulated wealth largely dampened by the Great Recession. Upper income households…not so much (surprise!). Why am I including the headline here? Seems to me that a city with a lot of good mobility options — including transit — provides both a safety net for lower income households AND a way for other households to save money if they either don’t have to drive as much or perhaps need one less car. From the Dept. of Go Metro: Bruce Springsteen & the E Street Band are playing the Expo Line-adjacent Sports Arena on March 15 and 17. For those hoping to get tickets this morning, good luck! To my millennial friends: once upon a time at rock-n-roll shows, musicians played electric guitars, drums and saxophones — back before they got PowerBooks. If you have some spare coin, Springsteen is worth a look-see. Dec. 9: Uber’s latest biggish idea, health clinics at transit stops? Please explain how a fare system that costs $3.50 just to do a roundtrip to the neighborhood supermarket to do grocery shopping or their minimum wage job close by is helpful for low and middle income earners, while the wealthy who are able to afford homes way out in the suburbs pays the same $3.50 to do a 20 mile roundtrip (also getting free parking to boot) to earn $50,000+ or more in a cushy white collar office job? Transit is good. You gotta do something about the price to consumer first though. Lower the cost for shorter trips, increase the cost for longer trips. It’s only common sense. All idealism aside is that there is no such thing as 100% automobile-free in any city, inclusive of the Hamburg example that has been cited. You cannot for example, get rid of commercial vans and trucks which are used in all sorts of trade (how do you expect Mike Diamond to come to fix clogged drains? Carry all his tools and gear on a bike? ), emergency vehicles, delivery vehicles, taxi cabs, food trucks, and recently, the growing popularity of ride-share services which if banned, will face significant backlash from Millennials today who embraces its concept. Trade shows and sports venues are also heavily auto dependent – not to go to these events, but are used extensively by those who prepare for them. Such aspects are major economic contributors here where sports games, concerts, and industry trade shows still would need cars and trucks to bring in all the freight needed to hold such events. People can certain use transit to go to these events, but the events themselves can’t be held or prepared without the need of autos. And my skepticism says that politicians themselves are not going to give up their own cars either and even if passed, they will make certain that they’ll include exemptions so that the law doesn’t apply to them. And the flip side of European examples is that you also have Asian countries which offers just as good transit mobility options without a need for a blanket ban on cars. If you reduce the number of personal cars (certainly possible), you can’t say to people that they can’t use motorcycles and scooters instead, like Taipei. What’s the basis of not allowing motorcycles and scooters? You can’t say that they aren’t eco-friendly when they get much better gas mileage than even hybrid vehicles, and just like electric cars, electric bikes are now on the market that don’t require fossil fuels at all so that throws out the eco-libs arguments there and you can’t say that these vehicles hog up space as they’re not much a space hog compared to a car. Oh, you can have a car-free city. https://en.wikipedia.org/wiki/Alfama (In this district, the slopes are too steep for automobiles, and the very narrow streets often turn into staircases; things *have* to be brought in by other means than cars). It’s not exactly *desirable*. Cars are useful. It’s an excess of cars which is problematic. Pretty much the same thing George W Bush would have done? I’m voting for Bernie this time.